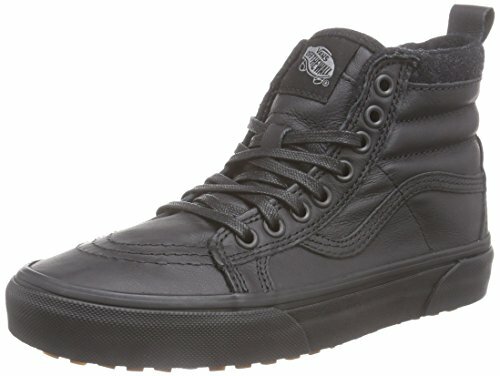 Keep your favorite brand on your feet in any weather with the Vans® SK8-Hi MTE! (MTE) Glazed Ginger features classic red and black plaid. (MTE) Glazed Ginger/Plaid features black plaid. High-top silhouette designed for colder days. Premium Scotchgard™-treated leather uppers. Fleece, flannel, or textile lining for all-day warmth. Heat retention layer between sockliner and outsole keep feet warm and dry. Snow-inspired lug outsole for superior traction and style. Imported. Measurements: Weight: 1 lb 6 oz Shaft: 4 1⁄2 in Product measurements were taken using size Men's 11, Women's 12.5, width Medium. Please note that measurements may vary by size. Premium Scotchgard™-treated leather uppers. Fleece, flannel, or textile lining for all-day warmth. Heat retention layer between sockliner and outsole keep feet warm and dry. Snow-inspired lug outsole for superior traction and style. Imported. Measurements: Weight: 1 lb 6 oz Shaft: 4 1⁄2 in Product measurements were taken using size Men's 11, Women's 12.5, width Medium. Please note that measurements may vary by size.